Passenger rides are a mixed blessing. Yes, you get to travel in a new car but can you really tell what it’s like without the steering wheel in your hand? For decades, motoring journalists have fretted over what one can justifiably say after a few miles in the wrong seat. This time, I’m not even going to try. 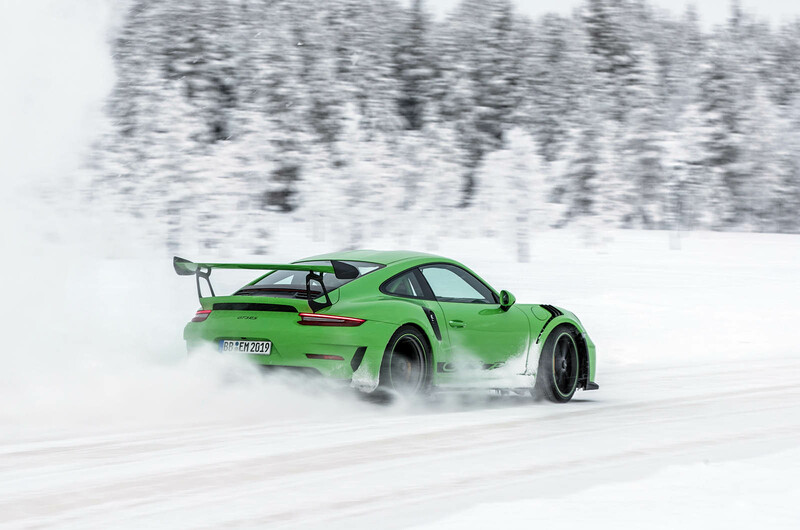 Because not only was the 911 GT3 RS in which I travelled being driven by rally legend Walter Röhrl but we were also on a track cut into the ice at the Porsche Winter Driving Experience centre, some 120 miles the chilly side of the Arctic Circle. I can’t tell you how fast it felt because even on studded tyres it would spin its wheels at any speed and I can tell you nothing about the way it rides because, well, we were on ice. What I can tell you is that Röhrl made it feel sublime, which I know will come as no great surprise to anyone. But even at the age of 70, the combination of inch-perfect precision and raw, pedal-through-the-firewall aggression appears as intact as when he won his WRC titles in 1980 and 1982. 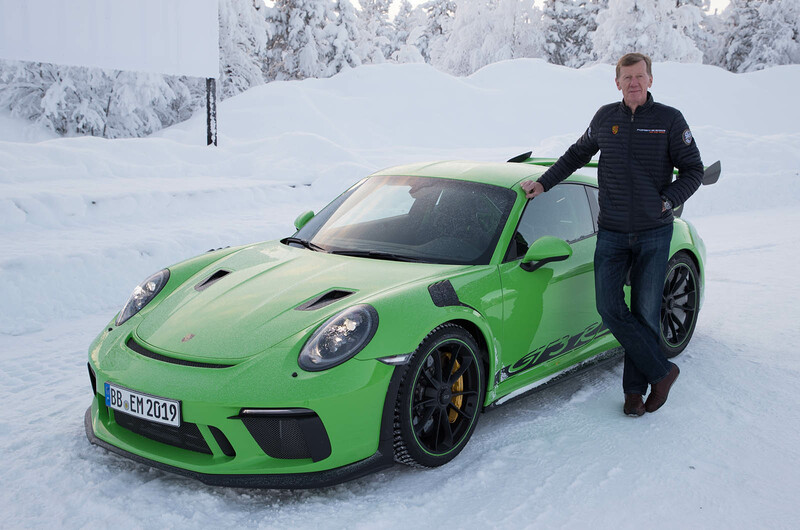 As for the car, well, Röhrl has spent so much time in 911 GT2 RSs of late, he describes everything else – this GT3 RS included – as ‘kindergarten cars’ but, from the viewpoint of a slightly bemused passenger, it seems to suit his style. What I remember most is the noise: the sharpest, cleanest, most savage sound I’ve ever heard a road-going 911 make, and I include the GT2 RS in that. I can’t tell you how the power feeds in because Röhrl kept the motor between 6000rpm and 9000rpm the whole time, but Porsche’s Andreas Preuninger says the extra power starts to manifest itself from about 4500rpm compared to the standard 911 GT3. Then there’s the handling. There appeared to be no angle from which it could not be recovered, no slide that some strange confection of hand and foot work could not correct. How much of that was the car, and how much Walter? That, I am afraid, will have to wait until we drive it for ourselves later in the year. There is a video somewhere of what I call Walter doing the 2 step dance. It is a camera on his feet when driving an Audo Quattro (I think in New Zealand rally) which was not just awesome but down right mind bending. But I honestly dont remember him racing in rallies with a Porsche?? Of course its the same stable now, but I think name pinching is really sad because Porsche have finally thankfully long over due run out of tweeks !! It's the Rally de Portugal and if I remember right, he's wearing some rather fine blue suede adidas boots. What's even more mind boggling is when the camera cuts to the windscreen view and you see the spectators running out of the way of the oncoming car. Typical Porsche fair, always dramatic, and apart from a few hiccups, always turns out a stunner, doesn’t matter what the others do, a Porsche 911 has been on most Car lovers Wall. I am not much surprised to hear this. Porsche has always surprised us with their 911 GT3. And every car lover across the globe does have the dream or desire to own one. The power loose diamonds this car delivers is really incredible and that too without losing any control.